I’m back at school. So far so good. Today will be the test. My Tuesdays and Thursdays are very long, I’m used to having afternoons to myself. Now the time that would be for Oprah (yeah I’m a fan, I should have gone with her to Australia!!!) will be spent in an art history class. At least it’s a subject I’m interested in. I’m excited for this semester. I think I made the right decision to go with art. Earlier this year my grandmother told me that money means nothing if what you’re doing isn’t what you love. The same could be said for school. I could be pursuing any number of things, but none of them would make me enjoy going to school each day. This semester is not so much an academic challenge, but a creative one. It’s all so new. Can a chronic doodler learn how to draw? Can I go from film to digital (with editing) photography? Can I handle the critiques? This is the biggest step outside of my box I’ve taken since the waitressing job, and this one means so much more. I’m excited, I’m scared, but I don’t think I’ve ever felt more ready. Hopefully I’ll still have this feeling in a few weeks, and by the end of the semester. This is my last semester at my community college. As much as I appreciate the opportunities I’ve received there, I’ll be happy to leave. It was my stepping stone, but I’m ready to move on. I’ve already submitted one application, but I’m dragging my feet on the last one. I don’t want to go this school. It’s not the right place, and I know that more than ever. I just hope things work out with my first choice. I hate waiting. I guess it’s true…time will only tell. I went to the endo yesterday. My A1c is 6.5! We talked about weight loss options, moving on to a different endo, and a few other things. I have a lot to say, but I don’t have the time right now. I just wanted to write this down. Let’s talk about life. Let’s talk about it twice. Things change and I’m totally okay with that. That hasn’t always been the case. Extremely resistant to change, pretty much explains how I used to be. The first sign of difference that wasn’t on my terms, and it was time to go. Today it’s more like cautious but flexible. I’m reworking a friendship. It’s been rough. Words have flown from places I never could have imagined. The waters seem calm now, but there are definitely storms ahead. This is growing up, and it’s harder than I would have ever thought it could be. There is someone new in my life, but I’m not sure how to explain it. Just friends, I guess. Several reasons why it has to stay that way, including but not limited to the fact that I could totally be reading into it too much. I’m okay with it. It’s been nice having this new kind of friendship. I just don’t want to become one of those awful girls who falls (hate that term) for a totally and completely unavailable person. It’s kind of like throwing yourself in front of a bus, everyone gets hurt. To be honest, I’ve always thought I was immune to boys and their mysterious ways. I guess not. I submitted my first transfer application last night. I felt sick afterwards. I don’t think I’ve ever wanted something so badly. It’s my first choice school. Crossing my fingers. I need this. I think I’ll share my essay here after I find out the news…February/March where are you??! I still have to submit one to my second choice school. I can’t bank on my dream just yet. Plus, it’s kind of a requirement of my scholarship to apply to this school. I guess a 3 page essay on an important global issue and how I would use my education to change it won’t be too hard. Diabetes anyone? Diabetes and art…I’m letting it marinate. I’m back in school. Sort of. It’s just a 6 day winter class. It’s been entertaining and draining. I was just at that point where I was letting myself sleep in, and BAM school! I’ll be back for real in just over week. I’m looking forward to this semester, but I’m also a little worried. I’ll be immersed in my art major requirements for the first time. I’m a little scared that I won’t have the skills required. My other semesters have been academic challenges, this one will be a creative challenge. On top of that I’ve got a portfolio to build for a separate major specific application to the first choice school. Only time will tell. I haven’t written about diabetes since October. That’s the last time I went to the endo. It was a good appointment. I went alone for the first time, and I got back my lowest A1C ever! After that Diabetes took a backseat. 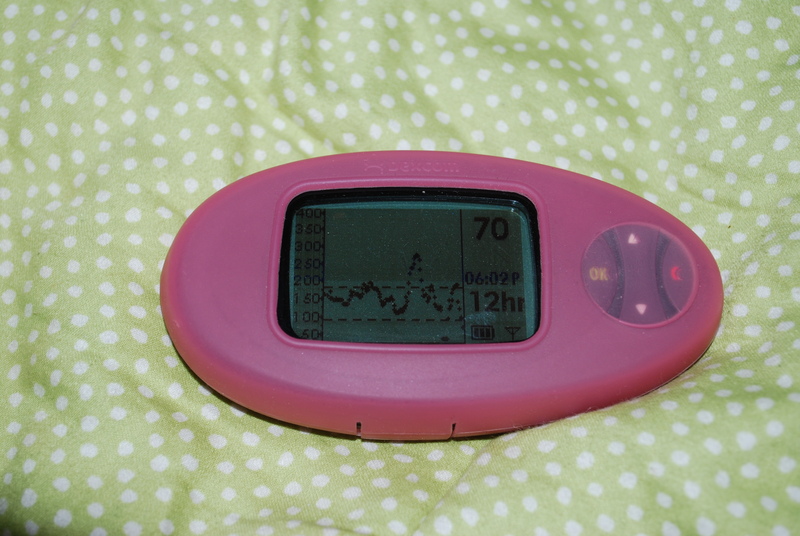 A rough semester and dependency on my Dexcom changed the way I managed my diabetes. I check a little less often. Although old habits die hard and I still have the battered fingers of a 10 times a day tester. I couldn’t tell you the last time I checked the averages on my meter. Nothing to be embarrassed about really. It’s just that it took a lot of effort to find the things that work for me and now I’m just kind of stuck. It took years to figure out that Chinese food needs to be more of a rare occasion meal and how to bolus for pizza. I fought for years against the pump, but now I don’t know what I’d do without it. I’ve adjusted to Dexcom and the second site it requires. But I feel like I could be doing things better. I could be more diligent. That 6.4 could be a 6.0. I could remember how many days my infusion site has been in. The current one, possibly day 3 or maybe it’s 4. The Dexcom sensor? At least 11 days, maybe more. I could be eating better, exercising. It’s hard to change your habits when it seems like you are doing okay. I’m thankfully complication free. Although I do have moments where I wonder if there is something I’m just not noticing. I’ve got a clean bill of health and a “see me in a year” from my eye doctor. I should be happy. It seems like things are okay, but I feel like I’m doing it all wrong. Like I don’t care enough. I used to be consumed by the numbers, obsessive, sensitive to changes. I think I rely too heavily on the Dexcom for alerts. All the signs say I’m doing things right, but I can’t help but feel like I’m not. Diabetes is so tricky. It’s an emotional game. In 2010, there were 21 new posts, growing the total archive of this blog to 51 posts. There were 9 pictures uploaded, taking up a total of 11mb. That’s about a picture per month. The busiest day of the year was September 3rd with 30 views. The most popular post that day was I haven’t been this scared in a long time. The top referring sites in 2010 were diabetesdaily.com, diabetorandme.blogspot.com, nhstuff.blogspot.com, countrygirldiabetic.blogspot.com, and Google Reader. Some visitors came searching, mostly for all ways jillian, get so caught up everyday, allways jillian, just for one night no one will ever know, and take me the way i am.